Fresh Water Friends receives many thank you responses from the people living in villages after a life-giving, fresh water deep bore well is installed. Above is one of the more recent ones. 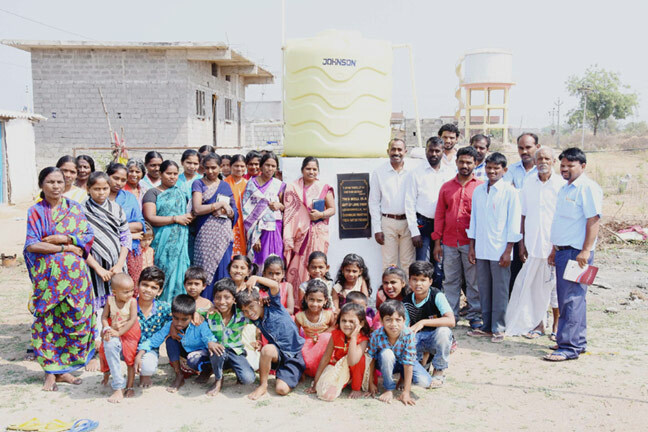 This particular well is providing for over 600 homes in their village, and the children can now stay in school instead of going out to get water each day! This is what we mean when we say that "We're not just giving water, we're giving everything else that water brings." Please know that your donations toward either the water wells directly, or the General Fund to keep the ministry going, helps more people than we will ever know and provides the foundation for them to build their life upon so they can get an education and better jobs for their future. We thank you and so do they. A gracious gift from the Foundation for International Cooperation made this possible. March 22 was International World Water Day … And what a way to celebrate the Day for this church and village! The pastor writes: “We give thanks to the Lord, who provided fresh and clean water to this church & village. This is a gypsy village, there are more than 600 homes in this village, and more than 3,000 people live in this community - basically outcast from the rest of the communities. They depend on mainly agricultural jobs and livestock, collect honey in the wild, and firewood, sell them in nearby towns. Women and children are so happy, they get to have fresh and clean water, especially in this drought season. Before they use to walk 1 ½ miles to get water. 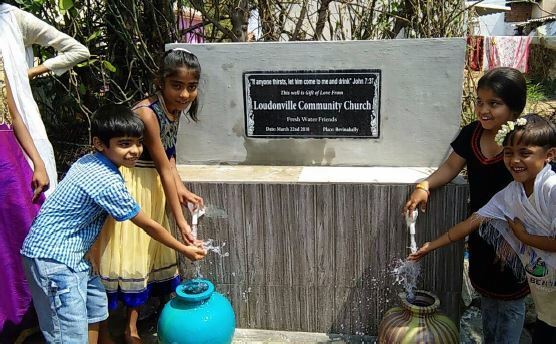 Having a deep water well in their own village, and having access to water through church, it’s truly a blessing!” The pastor and his family are very excited and thankful to Loudonville Community Church and Fresh Water Friends for giving them something they could never afford. Many thanks to Prakash who directed his team of excellent workers in India to drill this amazing deep well. Pastor Joshua writes: “We as a church are so thankful to God for all the blessings that he has been giving in our lives. 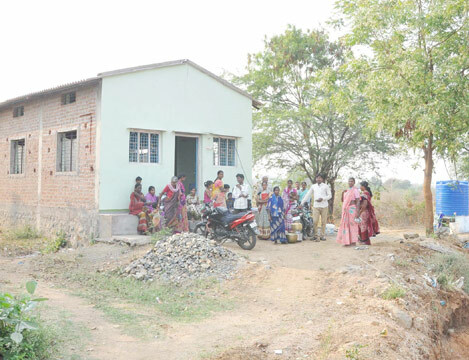 About 1500 people live in Pulla Kota village. Most of them are agricultural workers. A few work as daily wage laborers. The villagers struggle due to the lack of sufficient drinking water because it is a remote, dry area. During the summer, there is even more water scarcity. The Pastor of the village church writes: “Puliyangudi is a backward village which has no basic facilities. The government and local authorities ignore this village which does not have an adequate water supply. The villagers suffered a lot because of the lack of drinking water and water for other purposes. This deep bore well will not only be useful to the church but also to the entire village! The people may fetch water from the well any time they need to. We are so thankful to Armor VBS, Fresh Water Friends, and Patmos, Indonesia who sacrificially contributed to this well. We will be able to share the love of Christ among this community stronger than ever!” The church and pastor were so deeply thankful to the Lord for this water well which is a great gift to them and the people to whom they are ministering. About 240 people are regular to the church and active in the church ministries. They have the privilege of serving this community by providing a deep water well for them. About 2,500 people live in Mutharam village. The villagers used to travel by auto rickshaw or by two wheelers. People struggle to get sufficient drinking water because it is a dry area. They have to depend on water supplied by the government once every 3 to 4 days. We are sure that many, many people will greatly benefit from this well! The State of Karnataka has been facing continual drought for the past 5 years. In 2017 alone 371 farmers killed themselves by hanging or drinking fertilizer chemicals. In some villages, entire families have committed suicide, because of the resulting crop failure and inability to pay their loans. Rise India has been working the past 15 years in this State, mainly in rural areas serving among Dalit “untouchable” people, and among temple prostitutes. We are bringing hope to them with economic development through seminars, conferences, medical camps. Rise India is also offering free Trade School education for underprivileged young people to enable them to get a job and make a living. 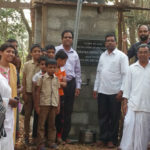 This well was dedicated on 14th December 2017. Special thanks to the donors – Fresh Water Friends and Grace Fellowship Church (Latham, NY) - for this timely and incredible provision! According to the field representative: “This village has faced water scarcity. Wadivaadi village is basically dry area. The local people and farmers depend only on rain water. Local village people get drinking water provided by the local government only once in every 3 weeks which is not sufficient to meet the water needs of the people. God has answered our prayers and opened the door through Fresh Water Friends. We can now have lots of clean water for the church and village! We will all benefit from this gift. "Thanks be to God. Greetings to you in the Name of Jesus Christ. I am pastor George. About 26 years ago, I started this church and now almost 50 believers worshiping the Lord. Last 26 years, we had no well of our own, nor any clean water to drink. We carried water from long distance for the church use. In this time, we heard about Fresh Water Friends through pastor Dilert Regulas. Then God answered our long years of prayer. Now we have our own Water Well!" 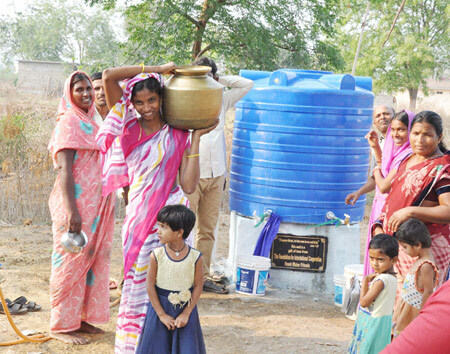 "Our new well is very beneficial to all church members and our neighbors too (over 125 people). We, as a whole church, extend our hearty thanks to Fresh Water Friends and Affirmation Church for supporting and giving to this good project. Thank you so much for fulfilling our long years of desire. May the Lord enable you to give many more bore wells to the poor and needy. Thank you all again!" The village of Souri Palayam is very arid. People walk great distances to get water. The area is highly populated so the need for water is great. The government has neglected them, but this well will help provide water to the community. 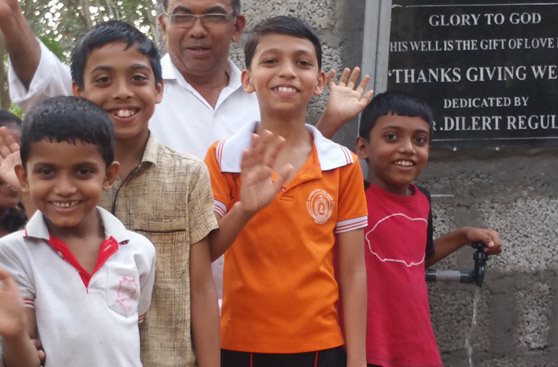 ​Pastor Jeyaseelan has been pastor since 2004 and writes This well is certainly a great blessing to the people. It helps the church to show the love of the Lord in a wider way. Through this water well we can also show the Living Water to the community. We are so thankful to Fresh Water Friends, Orchard Park, NY and IGL for taking the initiative to provide us this water well on our campus. We will be praying you in our daily prayers. Around 9000 people live in Dammaiguda. The villagers are struggling to get sufficient drinking water because it is a dry area. They have to depend on public water which is only available every three or four days. Summers are especially difficult. 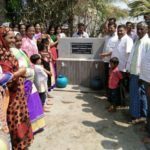 Pastor David Damodar states "We as a church have been praying for 10 years for a water well that will be very useful for our community and church. " Pastor Damodar prayerfully started the church ministry here in 2000. At present, around 130 believers regularly attend the church and are active in the ministries. The Fresh Water Friends, Adirondacks, NY for granting us this Living Water Project. We are sure that we will be always remember them in our prayers. 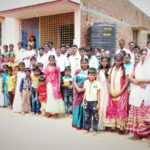 Pastor Arputharaj writes, The Lord blessed me with a church and about 175 believers are taking part in the services regularly. The ministry is growing day by day. 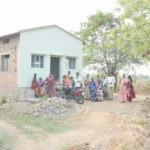 Sundarapuram used to have good water facilities, but due to the extension of the city, a lot of new houses are being built with deep water wells. As a result, we have started to face water problems. We were having a very difficult getting water for our family, church believers, bible students and community. The water demand was increasing daily. The local government starting supplying water to help the situation, but it was not sufficient for us. We approached IGL prayerfully. God opened a way through the donor. I am so thankful to IGL and Fresh Water Friends, Aiken, S. C. for making our dream possible. We will be praying for them in our regular prayers. We also committed to give water to everyone in the community. May God be glorified! Pastor John writes, I was born and brought up in a Christian family. I have been led by the Lord my whole life. I am so thankful to the Lord for my parents who taught me the ways of the Lord. I got the call of the Lord for ministry in 2004 and have been ministering for the past 13 years. Although our village is named Green Garden, we suffered daily due to the lack of water. People would only be able to get water once a week. Every day they would have to walk 2 kilometers or ride bicycles to get water. The community and the church suffered as a result of the scarcity of water. This well will be a great blessing to the church and the entire village. Now people can come and get water whenever they want. We are so thankful to IGL and Fresh Water Friends and Tom and Diane Cope for their sacrificial support in making this well possible on our land. We will be praying for the welfare of the donors and everyone who has been involved. Pastor Yuvaraj has been serving the Pattabiram church for the past 15 years in a Hindu dominated area. The scarcity of water has caused great difficult and suffering in the village and this church of 150 people. We as a whole church family deeply express our gratitude to FRESH WATER FRIENDS. Very tasty water God has given us. 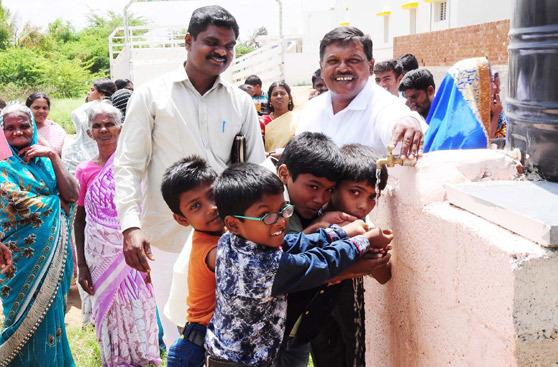 For the last 20 years Pastor Paul has been ministering to the people of Madhavaram, yet through this time the only water available was a yellowish water. This new borewell water is indeed tasty and no yellow color. It's good for drinking, and many other things. PRAISE THE LORD. We as a whole church of 45 members are very much thankful to the FRESH WATER FRIENDS and all who pooled money in to it! We give all the glory and honor to the Lord Jesus Christ who is the source of living water. Pastor Ebenezer has been ministering in Sunderarajapuram village for the past 18 years. The Lord is blessing his ministries and has used him powerfully to reach 110 people in this area. The pastor has faced continuous opposition here. People of this village have greatly suffered due to the scarcity of water. Through this water well the people of this village have an opportunity to experience the love of the Lord in their daily lives as they are allowed to get water from the well any time they need it. Pray that the village will be reached for the Lord through this water resource. Almost 40 Christians attend this church. For the past 8 years they have been facing a lot of difficulties due to the scarcity of water and praying to receive a water well. “Greetings to you in Jesus' Name. I am pastor Sathianathan ... Now we have plenty of water for us, for our church use and neighbors in the village." A water well was needed in Regadi which has a population around 7000. Most that live here are Hindus. They are from the Kunabi, Mahar, Madi, and Maratha people groups. They have to walk 3 kms to get clean water for their daily needs. The only well available in the village does not produce clean water and dries up in the summer. As a result, the people drank the unclean water and became sick often. 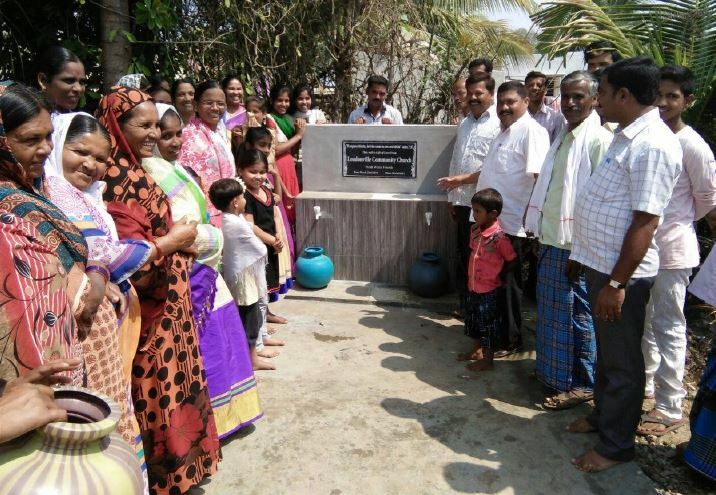 After the dedication, the villagers were jubilant as their lack of water came to an end. They thanked the Lord and the church. We pray this act of kindness and generosity will grab the attention of the people so that they can see the goodness of God. We pray that the people will understand the love of Christ in the days to come and that the kingdom of God will be extended through our works. The congregation was so thankful for this act of love towards them. Pastor P. Charles Gopi started the church here with much prayer in 2000. Through constant prayers and church ministries, the church started growing and now has 65 believers. This is the only church in the village. About 2500 people live in Kotha Kruma Naidu. A majority are Hindus, but there are 30 Christian families. The lack of water is a major problem during the summer. Pastor J. Nelson has been in the ministry for 35 years. 30 years ago he started the church in Neyyattinkara, a very remote village. For almost 15 years, the church had been going through very many difficulties, but now God changed that situation and 40 people coming to the church to worship the Lord. This place has the lack of drinking water and during the summer, no water in this area. We had been praying for a Well – and thank God for FRESH WATER FRIENDS! It is a miracle to us, because there was no hope to get a bore well. Vellalapatty is a small village near Salem with 400 families. As with many other villages, Vellalapatty suffers from the lack of water resources. Water is particularly scarce in the summer. 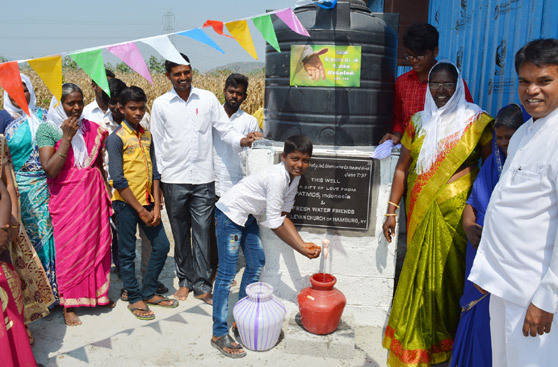 Because of this great need, a water well was provided to benefit of this village. This well will not only be used by the church but also by rest of the community. It is open to all. Pastor D. Joshua Barath has been doing ministry at Maharajapuram for the past 20 years. The Lord has blessed our ministries with 145 believers from surrounding villages. This area has more than 200 families. The people struggle to get safe drinking water. The need becomes higher when the summer season starts. The church believers also struggle a lot to get water when they come for the Sunday services. Now we have this well, and people need not suffer for water. This well will always be for the community. We are so much thankful to the Lord for opening the hearts of the people to support us in getting this water well. We will be praying for everyone involved behind the scenes to get this blessing for us. May God be glorified in and through us. Pastor Paul Kumaran has been serving the Lord and people for the last 22 years in the village Muthaputhupettai, Chennai in Tamil Nadu. We have 35 believers attending the church service. More than 1000 people living in very small huts and tents, most of them are non-Christians. As a whole church, we have been praying to the Lord for a wonderful provision. We thank God for solving the water scarcity. We, as a church, really thank FRESH WATER FRIENDS donors for giving us the bore well and the very tasty drinking water. We will ever remember you and your sacrificial, financial support for this project, and also may the Lord enable you to help out many more people to have bore wells. Thank God for Fresh Water Friends! I have been serving the Lord for the last 18 years. I started pioneering a church in my home town. My ministry is mainly concentrated in the slum area. After 8 years the Lord helped me to purchase a piece of land and construct a worship centre with the help of many pastors and friends. I have been praying for a bore well for the last 10 years. Through Fresh Water Friends we were able to get the deep bore well. All the members in the church are very happy now! More than 100 people are attending the church service now. All are from a very poor back ground. Now we use the water for all kinds of purposes. Let me express my sincere thanks to Fresh Water Friends for giving us this bore well. We thank you so much for your valuable support in the Lord's ministries. May God be with you all and bless you all. The village of Nandur has 1000 - 1500 families and is a very dry area. The people struggle to get enough water for their daily use. They have to go long distances to get drinking water. The local government doesn’t care about the needs of the village and has forsaken them. Most of the people are daily wage laborers and can’t afford to spend hours fetching water. If they do so, they will lose their daily wage. Pastor Prusotham started the church among much opposition in 1993. The drinking water is always scarce in this village during the summer. About 80 families will benefit every day through this Living Water Project. People have started to understand the loving heart of the pastor towards the community. They now hear the gospel and are coming to the church. Through the constant church ministries, the church is growing. In a village of 3,200 souls nearly 490 families follow Hinduism, 60 families are Muslim, and 40 families are Christian. The villagers mostly depend on rain water for agriculture. If there isn’t enough rainfall, then the villagers face starvation. Water is very scarce during the summer having to walk at least two kilometers to get drinking water. We as a church have been praying for a long time for the Living Water Project for our community and for our church believers. God answered our prayers ... We are so thankful and grateful to God for our president, Rev. Samuel D. Stephens, and for the donor, Fresh Water Friends, USA, for granting us this Living Water Project. More than 100 Hindu families are living in this area. In that, 16 families became Christians and are now coming to church to worship the Lord along with us. For the past 25 years we suffered a lot because of the scarcity of the drinking water until January 2016. We had to bring water from a kilometre away for our daily needs. We heard about Fresh Water Friends through Pastor Dilert. We started praying for it! As a result of that, God opened a door Fresh Water Friends to have a bore well in January 29th, 2016. Now we get sufficient water for the needs of the church. It was impossible for us to even dream for a deep bore well, because the believers are very, very poor. But God made it possible for us. Pastor Bushanam started the church here 9 years ago amidst opposition. He started doing ministry very prayerfully, and God started adding the believers gradually. Now there are 48 believers in his church. The Sharon church had been praying for a long time for our community and for our church believers to receive a well. Our community people and our believers had to travel 2 km to get drinking water. Water is especially scarce during the summer. Through this Living Water Project, about 300 people will benefit. Through constant church ministries, the church is growing gradually. Pastor C. Aaron accepted Christ as his Savior in 1994 and has been in the ministry in this area since 2000 carrying out the will of the Lord. About a 1000 people live here. They are diverse in their beliefs and are divided by the caste system. The high caste people do not even give water to the low caste poor people. The entire village, including the church believers, have been suffering without having enough water. I was born and brought up in a Hindu family. My mother fell sick and received miraculous healing from the Lord. Through this incident we accepted Jesus as our Savior. I got the call of the Lord to ministry in 1997. I left my small business and became a full time pastor. The Lord has blessed us with 70 believers. The village S. S. Nagar in Kovilpatti lacked sources of water. The hand pump provided by the government had not been in use for the past five years because the water level dropped below 300 feet. Drinking water was being sold for 5 rupees a pot. It is very difficult for the poor people to afford that much money for water. We were also in need of water for the church maintenance and believers’ usage. Because of this situation, the provision of this water well is a timely gift to the community. Around 75 families near the church will benefit because of this well. I have been doing God’s ministry in Gajulapalli village for the past 15 years. It is 20 kilometers from the town of Chitoor. There are 1500 houses in this village where various castes live together. The people in this village have suffered because of the lack of drinking water. They have had to walk up tothree kilometers to get safe water to use. It is difficult to even get water for bathing. The politicians and leaders in the village did not care about the essential needs of the people. I am so grateful that God has opened a door through the Vision 2000 movement and IGL to step in at the right time to support us in getting safe drinking water. I.P.C. Church is 86 years old now. Over the last 86 years, the pastor's family and believers coming to church, but lacking water. Once again, we thank you very much and praise be to the Lord Jesus Christ who is the source of Living Water. We are very much thankful to the Lord for the wonderful provision of Bore Well. Since 2008 were struggling for the water. We faced a great deal of struggle with regard to water. It's very much useful for the church and village. Our people use it for drinking. It's connected to the kitchen and rooms as well. 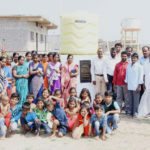 I earnestly pray that this ministry of providing water wells through Fresh Water Friends may continue in India with this good work, so that many people will be benefited and the Name of the Lord be glorified. THANK GOD FOR THE FRESH WATER FRIENDS! 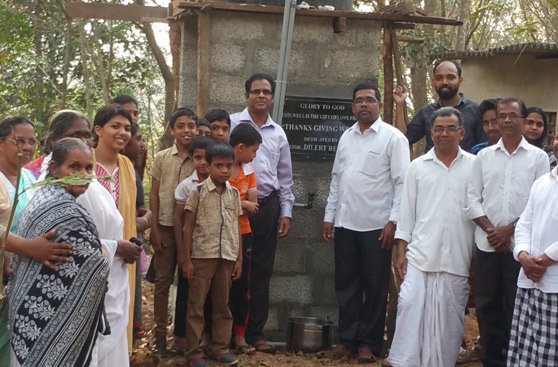 This well has been drilled at Immanuel Bible Church in Punnavoor. Punnavoor village is a small, poor village in southern India. About 70 Hindu families are living here. In the last 12 years, we had no water for the day to day life and for the needs of the church. We went to a far place and brought water for the needs of pastor and family and church needs. 12 years ago, our pastor Dilert Regulas came there and started a ministry, sharing the word of God, and God opened people's hearts and he built a church building. Now, almost 18 families coming to church to worship the Lord at this church. Ikkanagar has been facing a water scarcity problem for many years. People have had to walk a minimum of 3 km to get safe drinking water. The Lord has now opened the door for the pastor and his church to get water through the Vision 2000 movement. This village has a population of about 350 people. Most of them are daily laborers winning their daily bread and live in huts. There is no water facility in the entire village. They spend their earnings for alcohol consumption. Because they do not make much money as laborers, they suffer with debts. The literacy rate is very low as they do not send their children to the school. Most of them follow Hinduism. Pr. N. Surya Rao started the church ministry in 2002. In the beginning, there was heavy opposition against the church ministry. At present there is no opposition, and the church is growing gradually. There are 48 believers in the church, and 38 of them are baptized believers. We believe that many more would realize the love of Jesus Christ through this Living Water Project in the near future.